Eprosartan is an angiotensin II receptor antagonist used for the treatment of high blood pressure. Tasosartan is an angiotensin II receptor antagonist. Fosinopril is an angiotensin converting enzyme (ACE) inhibitor used for the treatment of hypertension and some types of chronic heart failure. Perindopril Butylamine Salt is an angiotensin-converting enzyme (ACE) inhibitor. Lisinopril is angiotensin-converting enzyme inhibitor, used in treatment of hypertension, congestive heart failure, and heart attacks, and also in preventing renal and retinal complications of diabetes. Moxonidine is a new-generation centrally-acting antihypertensive drug. It may have a role when thiazides, beta-blockers, ACE inhibitors and calcium channel blockers are not appropriate or have failed to control blood pressure. In addition, it demonstrates favourable effects on parameters of the insulin resistance syndrome, apparently independent of blood pressure reduction. Captopril is an angiotensin-converting enzyme (ACE) inhibitor used for the treatment of hypertension and some types of congestive heart failure. Azilsartan (TAK-536) is an angiotensin II receptor antagonist used in the treatment of hypertension. Zofenopril calcium is an angiotensin-converting enzyme ACE inhibitor. Azilsartan medoxomil is an orally administered angiotensin II receptor type 1 antagonist with IC50 of 0.62 nM, which used in the treatment of adults with essential hypertension. Ramipril is an angiotensin-converting enzyme (ACE) inhibitor with IC50 of 5 nM. 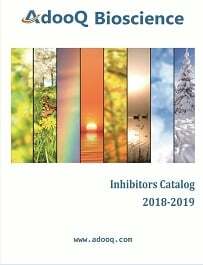 BIBS39 is a nonpeptide angiotensin II (AII) receptor antagonists that displaced [125I] AII from its specific binding sites with a K(i) value of 29 +/- 7 nM for the AII subtype I (AT1) receptor and a K(i) value of 480 +/- 110 nM for the AII subtype 2 (AT2) receptor. Eprosartan (mesylate) is a competitive AT1 receptor antagonist with IC50 values ranging from 1.4 – 3.9 nM and an elimination half-life of five to seven hours. Imidapril (Tanatril) is an inhibitor of angiotensin converting enzyme (ACE). Telmisartan is an angiotensin II receptor antagonist that inhibits the angiotensin II AT1 receptor. Olmesartan is an angiotensin II receptor antagonist indicated for the treatment of hypertension. It may be used alone or in combination with other antihypertensive agents. Olmesartan medoxomil is an angiotensin II receptor antagonist used to treat high blood pressure. Olmesartan works by blocking the binding of angiotensin II to the AT1 receptors in vascular muscle. By blocking the binding rather than the synthesis of angiotensin II, olmesartan inhibits the negative regulatory feedback on renin secretion. Angiotensin II (Ang II) is an octapeptide hormone that plays a central role in cardiovascular homeostasis. Angiotensin I is formed by the action of renin on angiotensinogen. Angiotensin (1-7) is an endogenous peptide fragment that can be produced from Ang I or Ang II via endo- or carboxy-peptidases respectively. Angiotensin III is a hexapeptide formed as a result of a cleavage at the N-terminus of Angiotensin II, a key factor in the Renin-Angiotensin-Aldosterone (RAAS) system by angiotensinases located in red blood cells and the vascular beds of most tissues. Acetyl Angiotensinogen (1-14),porcine, The protein encoded by the Angiotensinogen gene is known as pre-angiotensinogen or angiotensinogen precursor. Angiotensin 1/2 (1-5) is a peptide that contains the amino acids 1-5 and is converted from Angiotensin I/II. Angiotensin 1/2 (1-6) is a peptide that contains the amino acids 1-6 and is converted from Angiotensin I/II peptide. Angiotensin 1/2 + A (2 - 8), potent endogenous vasoconstrictor peptide; derivative of angiotensin (Ang) II. VTP-27999 2,2,2-trifluoroacetate is an alkyl amine Renin inhibitor; VTP-27999 is useful for Hypertension and End-Organ Diseases. Spinorphin is an endogenous factor that exhibits inhibitory effects on enkephalin-degrading enzymes. EXP-3174 is a potent and selective noncompetitive AT1 receptor antagonist with IC50 value of 37 nM. Angiotensin 1/2 (1-9) is a peptide (ASP-ARG-VAL-TYR-ILE-HIS-PRO-PHE-HIS) containing the amino acids 1-9 that are converted from Angiotensin I/II peptide. Captopril Disulfide is a reversible and competitive inhibitor of LTA4 hydrolase (IC50=11 M). Captopril has been shown to be an of angiotensin converting enzyme-1 (ACE1), but not ACE2(IC50 = 22 nM). LCZ696 is an orally bioavailable, dual-acting angiotensin receptor-neprilysin inhibitor (ARNi) for hypertension and heart failure. Benazepril hydrochloride is a non-peptide angiotensin-converting enzyme (ACE) inhibitor. Reduces blood pressure and myocardial hypertrophy in spontaneous hypertensive rats. Clinofibrate is a lipid clearing agent that appears to modify lipid metabolism, diminishing the steroid induced accumulation of lipids within osteocytes. It also can effectively reduce the plasma fibrinogen level. Rosuvastatin is a member of the drug class of statins, used to treat high cholesterol and related conditions, and to prevent cardiovascular disease. Irbesartan is an angiotensin II receptor antagonist used mainly for the treatment of hypertension. Aliskiren is an orally active, synthetic nonpeptide renin inhibitor. Candesartan is an angiotensin II receptor antagonist used mainly for the treatment of hypertension. Quinapril inhibits angiotensin converting enzyme, an enzyme which catalyses the formation of angiotensin II from its precursor, angiotensin I.
Moexipril hydrochloride is a potent orally active non-sulfhydryl angiotensin converting enzyme inhibitor (ACE) which is used for the treatment of hypertension and congestive heart failure. Cilazapril is a pyridazine angiotensin-converting enzyme inhibitor (ACE inhibitor) used for the treatment of hypertension and congestive heart failure. Enalapril is an angiotensin converting enzyme (ACE) inhibitor used in the treatment of hypertension and some types of chronic heart failure. Enalaprilat is the active metabolite of enalapril. It is the first dicarboxylate-containing ACE inhibitor and was developed partly to overcome these limitations of captopril. Aliskiren hemifumarate is a hemifumarate salt form of Aliskiren, which is a direct renin inhibitor approved for the treatment of essential hypertension. PD 123319 ditrifluoroacetate is a potent, selective, non-peptide angiotensin AT2 receptor antagonist. IC50 values are 34 and 210 nM in rat adrenal tissue and brain respectively. Temocapril is an ACE inhibitor. Candesartan is an angiotensin receptor blocker (also called an angiotensin-II receptor antagonist or an AIIRA).